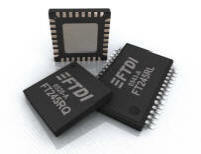 The FT245R is the latest device to be added to FTDI’s range of USB FIFO interface Integrated Circuit Devices. The FT245R is a USB to parallel FIFO interface, with the new FTDIChip-ID™ security dongle feature. In addition, asynchronous and synchronous bit bang interface modes are available. USB to parallel designs using the FT245R have been further simplified by fully integrating the external EEPROM, clock circuit and USB resistors onto the device. The FT245R adds a new function compared with its predecessors, effectively making it a "2-in-1" chip for some application areas. A unique number (the FTDIChip-ID™) is burnt into the device during manufacture and is readable over USB, thus forming the basis of a security dongle which can be used to protect customer application software from being copied. The FT245R is available in Pb-free (RoHS compliant) compact 28-Lead SSOP and QFN-32 packages. Press releases, articles and web links related to the FT245R can be found here. Single chip USB to parallel FIFO bidirectional data transfer interface. Simple interface to MCU / PLD / FPGA logic with simple 4-wire handshake interface. Data transfer rate to 1 Megabyte / second - D2XX Direct Drivers. Data transfer rate to 300 kilobyte / second - VCP Drivers. FTDI’s royalty-free VCP and D2XX drivers eliminate the requirement for USB driver development in most cases. Synchronous and asynchronous bit bang mode interface options with RD# and WR# strobes allow the data bus to be used as a general purpose I/O port. Integrated 1024 bit internal EEPROM for storing USB VID, PID, serial number and product description strings. Support for USB suspend / resume through PWREN# pin and Wake Up pin function. In-built support for event characters. Integrated level converter on FIFO interface and control pins for interfacing to 5V - 1.8V Logic.